Heading into Sunday’s regular season finale against the New York Jets, the Patriots were seeking to secure the number one seed in the AFC and lock up home field advantage throughout the playoffs. In the first quarter, the Patriots won the toss and elected to recieve in an effort to score early, they did just that for the seventh time in 2017. Dion Lewis has six rushing touchdowns, three receiving touchdowns and one return TD in the Patriots' last 13 games. Jets quarterback Bryce Petty got off to a difficult start seeking a response when he was caught by CBS cameras struggling to get his helmet on. In what would be a recurring topic of conversation throughout the afternoon, it was a little chilly in Foxborough. The Jets would get on the board with a Chandler Catanzaro 48 yard field goal to bring the score to 7-3 after one quarter of play. Despite early struggles connecting to wide receiver Brandin Cooks, Brady continued to show confidence in his new wideout, and found him from five yards out late in the second quarter to provide some breathing room. 14-3 Patriots. The Patriots defense throughout the first half shut down the Jets offense, and when they forced a three and out just before halftime, the Patriots offense continued to produce points in the final minute. A Tom Brady block helped setup Dion Lewis for yet another touchdown in recent games. Tom, your thoughts on the game so far? In the third quarter, James Harrison made his presence known, landing this big hit after the catch, and forcing a Jets punt. Wow, James Harrison with the big tackle on third down, dropping Anderson after just 2yds. Jets now forced to punt. Stephen Gostkowski would nail a 21 yard field goal to up the lead to 24-3 which was setup by this Dion Lewis carry. In what was otherwise an uneventful third quarter, Patriots cornerback Johnson Bademosi put on a terrific display of acting on the sidelines. In the fourth quarter, the Jets made Jet decisions, and elected to kick a field goal from 35 yards out to cut the deficit to 18 at 24-6. Wait. The Jets kicked a field goal, down 24-3 with 10:28 to play? … To make it an 18-point game? Huh? SCORING UPDATE: Catanzaro hits the 35yd field goal and the Jets cut the lead to 18 as they now trail the Patriots 24-6 w/10:28 to go in the game. Patriots defense has now held the Jets to 0/10 on third down after that series. The Patriots defense then put the icing on the cake with an Erice Lee safety on Petty. With the game clock winding down, James Harrison tallied back to back sacks, doubling his season total when he was in Pittsburgh. Two sacks in a row by James Harrison. The @Patriots clinch their seventh No. 1 playoff seed since 1990, most by any team in that span. The @Patriots allowed 32 points per game over the first four games of the season and 14 points per game over the final 12. Rob Gronkowski will finish the regular season with 69 catches. Not his best season, but still a pretty nice year. @Patriots fans are the toughest! Thank y’all for the support today! So, Harrison asks Chris Price how long he's been waiting at Harrison's locker. 20-30 minutes, Price says. 20-30 minutes? Hold out your hand. He then squirts a few pumps of lotion in Price's hand and says, "Can you put this on my back?" Lots to discuss after that win! 1st @j_bademosi24 is the worst actor of all time but I give him credit for trying! Hilarious! 3rd and final thing, as my guy Roby G would say (@RobGronkowski ) it was freezy freezy today but we got that dubbbb! Felt good to be back Pats nation! Now it's time to really get it. 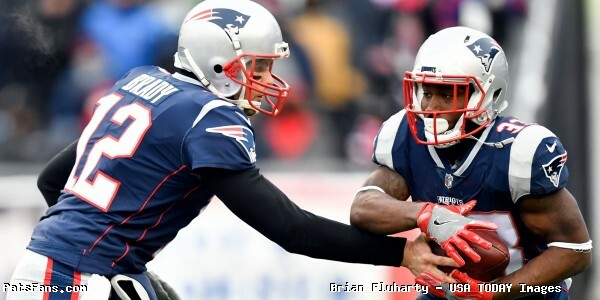 This entry was posted in 2017 NFL Season, 2017 Patriots Season, Patriots Commentary, Patriots Photos, Patriots Twitter, Patriots Video and tagged Brandin Cooks, David Andrews, Dion Lewis, Dont'a Hightower, Eric Lee, Johnson Bademosi, Jonathan Jones, Julian Edelman, Kyle Van Noy, Rob Gronkowski, Stephen Gostkowski, Tom Brady on January 5, 2018 by Robert Alvarez.